Russia reportedly will launch two GLONASS-M satellites this summer to compensate for the loss of a trio of the nation’s GNSS spacecraft in a July 2 failure of a Proton launch with three GLONASS-Ms on board. A recent news article by Russian news agency RIA Novosti quoted Nikolay Testoyedov, general designer and director general of Joint Stock Company “Information Satellite Systems – Reshetnev Company” (JSC “ISS”), that the launches would take place from the Plesetsk space center north of Moscow using Soyuz rockets. The first would come at the beginning of September and the second at the end of October. Testoyedov also told RIA Novosti that his company would build an additional 10 GLONASS-Ms during the coming year. RIA Novosti also cited an Interfax news agency report that a faulty installation of angular velocity sensors may have precipitated the Prcrash, which occurred 17 seconds into the launch. An investigation into the accident continues, but it appears that incorrect installation of angular velocity sensors caused the crash. 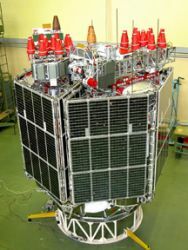 JSC “ISS,” based in Zheleznogorsk, Krasnoyarsk region of Russia, manufactures both the current generation (GLONASS-M) and next-generation (GLONASS-K1) satellites. One GLONASS-K1, launched in 2011, remains in the “flight test” category and launch of a second K1 in originally expected in 2012 has not occurred. According to a 2011 presentation to the International Committee on GNSS, a newer version of the GLONASS-K, the K2, had been expected to launch this year or next. The K2 will be capable of transmitting a full set of CDMA signals to supplement GLONASS’s legacy FDMA design. Despite the setback, the GLONASS constellation continues to operate with a full complement of 24 space vehicles, with three spares on orbit, in addition to the K1.